Architecture and Allied Arts began publication in New Orleans in July, 1905. It was published monthly under the auspices of the Louisiana Architectural Association. With its second anniversary issue in July 1906, the journal's title changed to Architectural Art and Its Allies. It continued under the new name at least through January, 1913 (the date of the last number held by the New Orleans Public Library). General Allison Owen served as its editor throughout most of the publication's existence. Early in 1910 the Louisiana Chapter of the American Institute of Architects adopted Architectural Art as its official journal and began sponsoring the publication along with the New Orleans Tree Society. Nathaniel Courtland Curtis took over as editor in November, 1912, shortly before publication ceased. A typical issue of Architectural Art included news articles of local, national and international architectural interest, letters to the editor, editorials, and advertisements. Individual issues were always well illustrated, usually with a combination of photographs and reproductions of building plans or other drawings. 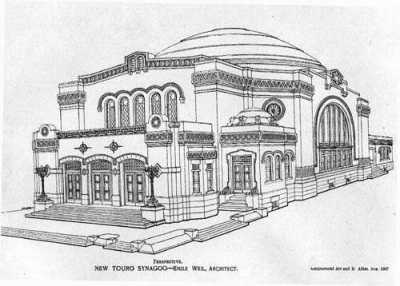 Several of those illustrations accompany this online index (including the image above showing Emile Weil's plan for Touro Synagogue from the August, 1907 issue). Many years ago Library staff members prepared a partial card index to Architectural Art. The index appears to include reference only to articles dealing with issues relevant to New Orleans, Louisiana, and, in at least some instances, neighboring states. The index includes at least some editorials but excludes letters to the editor and advertisements as well as articles/editorials dealing with projects outside the local area. In most instances the presence of photographs or other illustrations is indicated. This online index includes the information found in the old card index in an updated format. No effort was made to expand coverage or to resolve apparent conflicts between volume/number and date references. The Louisiana Division of the New Orleans Public Library has a complete set of Architectural Art and Its Allies on microfilm available to researchers at all times. The originals have been retired from use due to their condition but they are available for use in making reproductions for publication, etc.